Three studio albums and a live album brought Jimi Hendrix during his much too short life. This, still inimitable guitarist, singer and rock star spent a lot of time in the studio to jam and to work on new material. The piles of tires with unreleased material he left were already stop producing in the 1970s, until Hendrix ' entire artistic legacy in hands came from his family. They are more or less re-started with sorting all that raw material. People, Hell And Angels let Hendrix especially when singer/guitarist heard in bluesy repertoire, often accompanied by his Band Of Gypsys (bassist Billy Cox and drummer Buddy Miles). In addition, dives under the other singer/guitarist Stephen Stills and Singer/saxophonist Lonnie Youngblood next to him on. Everything sounds dry and rough, like Hendrix it itself has ever left behind. A wealth of material, but it does do hope that in the future also have some more experimental and psychedelic work of this versatile icon pops up. RE: mccflo99 March 6, 2013 review of People, Hell and Angels. What an intense and detailed review. I like it! It was the deciding factor to pass on this Hendrix album. Thank you. Here on People, Hell & Angels, a posthumous release of studio material that had been under consideration for both Electric Ladyland and its followup, has been presented as a time capsule of sorts ... mostly with Buddy Miles and Billy Cox, is totally free of overdubs, and comes at you like a bolt of lightening, splitting the sky, and knocking you back with rolling thunder. While most of this material has surfaced at other times, it’s still great to hear it gathered together in one place ... heaping helpings of smokin’ incendiary funky electric soul. And if you think you’ve heard funky electric soul before, just wrap your ears around Lonnie Youngblood’s staggering vocals, and tell me “Let Me Move You” doesn’t sound as fresh and futuristic as it did back in 1968 and ’69. With “Easy Blues” cooking like a more upbeat, less stoned “Rainy Day,” floating easy, and swaggering with a passion and style that’s pure Hendrix at his very best. This material is far more than cutting room floor gatherings, this is a solid album that’s worthy of anything Hendix ever rained down on us ... leaving me staggered for what I’m missing due to his untimely death. I thought having a numbered copy would denote it being a limited pressing yet I have seen UN-numbered copies so what is the value in having a numbered edition? Just to show you have a first run copy? Besides mine has a scuff on it at the beginning of track B3 and it was a sealed copy and neither Sony or QRP will work with me on replacing it! Did anyone who pre-ordered receive the poster? I didn't :-( I pre-ordered through Amazon UK on 21st December. Inferior Versions Of Already Released Songs - Amatuer Copy & Paste Work - For Completists Only. People, Hell and Angels is for Jimi Hendrix completists only. This is a very disappointing release that is FAR from “12 new studio recordings” as being advertised by Experience Hendrix. Almost all of these songs have been released in far superior versions on readily available retail releases. They have duplicated multiple songs from the Valleys Of Neptune album they put out just a couple of years ago also, including the second single from that album! I’ll break down the technical details of each song so you can see what you’re truly getting here. 3. Hear My Train A Comin’ - How many times do we need to see this song released? Studio versions of this song have been released at nearly a half-dozen times on official releases by the Hendrix estate over the years, including being released on their last “new Hendrix studio album,” Valleys of Neptune, just a couple of years ago! The song was released twice on the single disc Blues release, again on the Martin Scorsese Presents the Blues album, on The Jimi Hendrix Experience Box-set, etc. Not to mention the numerous live versions that have been released all over the place. This version on People, Hell and Angels is inferior to all of them and is NOT a studio version, this is from a practice run-through session of the band and they are mis-labeling it as a studio version, which is easily observable when listened to. It sounds like it was recorded in a garage and is the first time Jimi got together with Buddy Miles and Billy Cox to practice songs. Keyword being “first time” and “practice.” Sound quality speaks volumes on this one as you hear Jimi’s vocals distort in places. 4. Bleeding Heart - This song was released as a SINGLE off of the Valleys Of Neptune album they released just a couple of years ago and they release it again already? Two times in a row? Yet another studio version was released on South Saturn Delta. Here on People, Hell and Angels we get a far inferior version that is nothing more than a studio rehearsal, not a completed studio recording. The sound quality almost sounds like it was recorded in a bar and there is nothing fantastic about this take. 5. Let Me Love You - One of the truly “new” songs on the album and Jimi doesn't sing a single word in the song. This is actually a Lonnie Youngblood song that Jim just plays guitar on. A good song though. 6. Izabella - This song has been released multiple times. The definitive studio version has already been released on First Rays of The New Rising Sun. An alternate studio version from this same recording session was released on The Experience Hendrix box-set in 2000. They released yet another version on the Burning Desire album. The version we have here on People, Hell and Angels is far inferior to the already released versions. 7. Easy Blues - This is a purely instrumental song released on the Nine To The Universe album. Experience Hendrix claims that this “new extract” is nearly twice as long as the Nine To The Universe release, which is untrue. The Nine To The Universe release was 4:30 and this version is 5:57, a mere 1 minute and 27 seconds longer. It’s the same version, with another minute and a half of instrumental. Not sure if someone forgot how to do arithmetic or what. 8. Crash Landing - This song was released on the album Crash Landing, with the original instrumentation replaced by Alan Douglas, which a lot of people thought was insane to do. Here we get the original version, although Jimi’s vocals have been pasted from another take, and one beat behind, not in time! Eddie Kramer, how are you doing this to multiple songs on the same album? Better yet, how did this pass quality control after that glaring mistake? A shameful hack-job. Additionally, Eddie Kramer (producer) and John McDermott (catalog manager) both stated how horrible this recording was in the book they released, Ultimate Hendrix, stating that this song was “uninspired.” Now that they want to release it as some “newly found gem,” McDermott has changed his position from calling it “uninspired” to saying “it’s really good.” Interesting. 9. Inside Out - Yet another early instrumental version of Ezy Ryder, no vocals at all. They released two more early Ezy Rider jams on the “new studio album,” Valleys Of Neptune, and the Fire CD single from that same album just a couple of years ago! Add in even more Ezy Rider jams released on the Hear My Music and Burning Desire albums, and we’re just about at a half-dozen releases now. So now we’re getting alternate versions of recently released early versions of songs? 10. Hey Gypsy Boy - Released on the Midnight Lightning album with Alan Douglas overdubs, here we have the original version as Jimi intended it, which is nice to hear. 11. Mojo Man - Yet another song that Jimi has no vocals on. This isn’t a Jimi Hendrix song, it’s a Ghetto Fighters song with Jimi guest appearing on rhythm guitar. And when I say “rhythm guitar,” I means exactly that because there are not even any guitar solos by Jimi on this song. Additionally, it’s obvious a lot of tinkering was done to the song long after Jimi’s passing, none of which is very flattering. This song was also already released as a single by the Ghetto Fighters just a mere year ago – Not unreleased by any means. 12. Villanova Junction - John McDermott, one of the producers of this album and Hendrix catalog manager said in his book Ultimate Hendrix that this song was “disjointed,” but in a recent interview flip-flopped and said that it was “a sweet way to bring the record to a close.” This was what I expected to be one of the shining points of the album, but this is merely a 1 minute and 45 second excerpt of this instrumental that fades out in the middle of the jam, unbelievable. For an album that barely clocks in at 50 minutes long, it’s pretty obvious they could have, and should have, included the full Villanova Junction jam. Additionally, there was a 5 minute version of this song released on the Burning Desire album. To Casual Fans – Avoid this release completely. If you are a casual fan of Jimi Hendrix, this release is going to be sorely disappointing to you as almost all of theses songs have been released in superior versions on other retail releases. Additionally, this collection is not a fair representation as to the quality of Jimi’s studio material. Go with Are You Experienced, Axis: Bold As Love, Electric Ladyland, or First Rays Of The New Rising Sun. To Completists – Obviously a must-have, but be prepared to be disappointed in order to add this “new studio album,” to your collections when hearing some of the amateur cut and paste jobs on Jimi’s vocals, leaving them off beat in some songs (Somewhere, Crash Landing, etc.). Experience Hendrix created a sub-label called Dagger Records many years ago, which they use to release albums of alternate versions of songs, demos, and songs that didn’t have a place on mainstream studio albums. 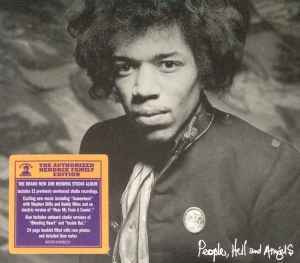 People, Hell and Angels belongs on that label as a release for Jimi Hendrix completists only. This is a pretty low cash-grab on the part of Experience Hendrix. In fact, Eddie Kramer, head producer on the project was interviewed on video by Harmony Central after mixing this album down and said “this is the, HOPEFULLY [emphasis added by Kramer], the last of all the studio albums,” which seems to imply he is being coerced in some capacity by Janie Hendrix to arrange inferior albums like this in order to fulfill contractual obligations to Sony. Pretty clear he didn’t want to publicize a collection like this as a studio album, because it’s not. They are duplicating songs that were on the “new studio” album they released just a couple of years ago (Valleys of Neptune), including that album's second single (Bleeding Heart)! And inferior versions of these songs at that. I was critical of their last release Valleys of Neptune, but still have it 3 stars out of 5 because it did contain some new music. However, this release is just shameful. This is a collection of nearly all alternate (and inferior) versions of songs that have already been released. There is so much duplication against their recent releases and songs that pale in contrast to their already released versions, that it’s clear what’s going on here: Experience Hendrix (Janie Hendrix) is doing everything they can to fulfill the 10 album deal they inked with Sony a few years back and it appears they are trying to slip by far inferior quality material and advertise it as “new studio recordings” to do so. That’s right; they are now contractually obligated to release 10 albums of “new material.” They have released Valleys of Neptune, Live In Cologne, the West Coast Seattle Boy box-set, the Winterland box-set, and now this release. That means they’re only half way to fulfilling this 10 album deal, so this is probably only the beginning of a string of horrid releases like this. Additionally, it’s important to note that there is still some good music contained on this album, but it’s not a studio album as advertised, not even close. This is a disjointed collection of demos, alternate takes, jam sessions & rehearsals, already released songs, instrumentals, and tracks that weren’t even Hendrix songs, but rather tracks he guest appeared on only playing guitar – All inferior to their already released counterparts. If released as an “alternate versions” collection or as a disc in a rarities box set, this would be a real gem and Hendrix completists like me would be happy to purchase an accurately billed release, aside from the few tracks that have horrible timing issues due to amateurish “cut & paste” jobs on Jimi’s vocals. However, the advertising of this being a “new studio album,” is going to do nothing but alienate many would be Jimi fans when they hear the inferior quality of these recordings and think that’s how Jimi’s “studio” material sounds. I’m being very generous in giving this album two stars despite of the inferior versions of already released songs included on People, Hell and Angels, and the amateurish (and off beat) pasting of Jimi’s vocals into many of the songs.